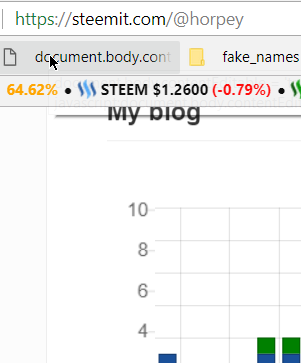 Welcome, Steemian! this is not a new trick but it will be useful for those who haven't come across it. Sometimes you may want to trick your friends, colleagues with some edits on Web pages. ✍️ Click anywhere on the web page to place cursor to the text you wish to edit. I guess I'm gonna try out this trick bro. Congratulations! This post has been upvoted from the communal account, @minnowsupport, by horpey from the Minnow Support Project. It's a witness project run by aggroed, ausbitbank, teamsteem, theprophet0, someguy123, neoxian, followbtcnews, and netuoso. The goal is to help Steemit grow by supporting Minnows. Please find us at the Peace, Abundance, and Liberty Network (PALnet) Discord Channel. It's a completely public and open space to all members of the Steemit community who voluntarily choose to be there. Wow! Impressive to edit the page on the spot. Thanks for sharing the code. Doesn't seem to work on the Brave Browser, I'll try Firefox.